Bold action on climate change could deliver $26 trillion in cumulative economic benefits by 2030, according to a new report by the New Climate Economy (NCE). Without immediate action to cut emissions, the costs of “runaway” climate change will be severe: heat waves, flooding, storms, food scarcity and sea level rise. Cities have been warned: they will need to peak their emissions as soon as 2020 and reach net zero emissions by mid-century to avoid a global temperature increase of more than 1.5 degrees Celsius. The cities of tomorrow can be places where people enjoy healthy, active, productive lives. They can be engines of economic growth, generating opportunity and wealth for the whole country. And they can play a critical role in avoiding dangerous levels of climate change – if governments act now to promote more compact urban growth. Higher compactness correlates with lower carbon emissions. 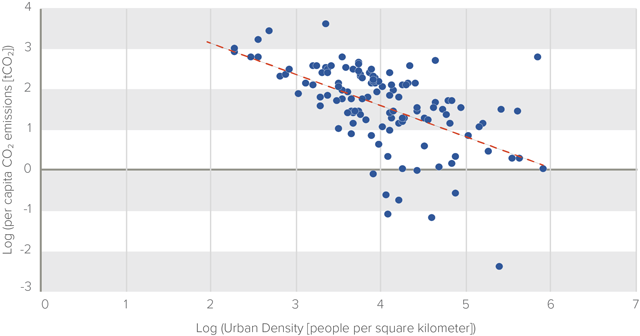 The report shows a negative relationship between number of people per square kilometer and CO2 emissions per capita. Compact cities produce fewer emissions because they tend to offer better access to public and active transportation modes, have greater energy efficiency, have lower environmental costs for infrastructure, and allow for more urban green spaces. But cities should not just pursue compactness because of the climate benefits. Higher population and economic densities also generate major economic advantages, according to the report by NCE, for which WRI serves as a managing partner and the Coalition for Urban Transitions is a special initiative. First, it is more expensive to construct and operate infrastructure to service sprawling communities. One estimate suggests that a more compact approach to urban growth could reduce infrastructure capital requirements by over $3 trillion between 2015 and 2030. Second, people living in sprawling cities have to travel farther to reach their workplace or public amenities and they face worse traffic congestion and air pollution as a result. In the United States, sprawl is conservatively estimated to cost around 7 percent of national GDP. Third, proximity encourages interactions where people can learn from each other and exchange ideas, thereby stimulating innovation. Evidence from Germany, Mexico, Spain, the United Kingdom and the United States suggests that doubling a city’s population is associated with a roughly 2-5 percent improvement in productivity for every resident. What Are the Barriers to Compact Growth? Millions of urban dwellers live in private houses with their own gardens and private cars. Millions more aspire to this type of lifestyle. The cultural norm of a “suburban” urban lifestyle is reinforced by economic drivers, such as the lower cost of land around the urban periphery and tax policies that favor single-family dwellings. But once housing and infrastructure has been built, it is extremely difficult to change urban form, potentially locking cities in to carbon-intensive patterns of growth. Perhaps the biggest challenge to breaking these locks is mobilizing the huge investments required to build or change transport networks. Once a city has highways, it is cheaper to extend them than to replace with trains, for example. 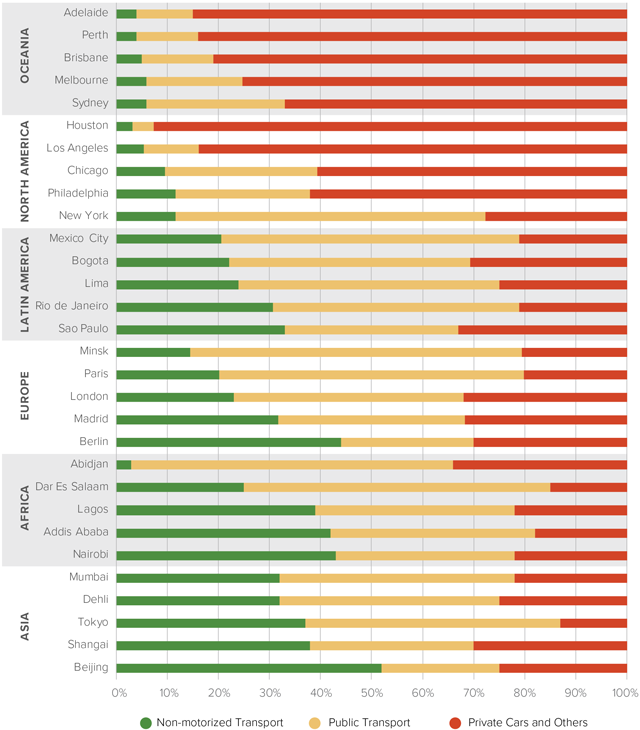 Cities in North America and Oceania depend most heavily on private cars. People living in these cities consequently have very high carbon footprints. Large cities in Latin America and Europe have a high share of people moving around by public transport. Latin America has long been a pioneer in public transport, from the bus rapid transit network of Curitiba to the cable car system in Medellín. And European cities have benefited from a dense urban core that pre-dates the development of the car. Cities in Asia and Africa see very high numbers of urban residents walking or cycling. This is often a function of poverty: many people cannot afford the bus fare, let alone a car ride. How Can Cities Achieve More Compact Growth? To achieve greater compactness, established cities like Sydney and San Francisco will need to find ways to move people out of cars and into other modes, like public transport, bicycling and even accommodating more trips by foot. This will involve retrofitting or replacing much of their infrastructure. Electrification might also help these cities reduce their carbon footprint, but it won’t deliver the wider economic gains associated with higher density. Fast-growing cities like Dhaka and Dar es Salaam will need to steer infrastructure investments toward more compact and inclusive growth. Building pedestrian walkways and cycling lanes for commuters can hugely reduce risk of traffic injuries, for example, while laying the foundations for more livable density. Transport investments are more effective with complementary national policies. Governments will need to reform spatial plans, building codes and tax incentives to discourage sprawl. And care should be taken to avoid the displacement of low-income or other marginalized urban residents as inner-city areas become more attractive. The next decade is a “unique ‘use it or lose it’ moment in economic history,” according to the NCE report, as more than $90 trillion is expected to be invested in infrastructure, much of it in cities. It will not be enough just to install a few solar panels, retrofit a few buildings or recycle a few more newspapers. 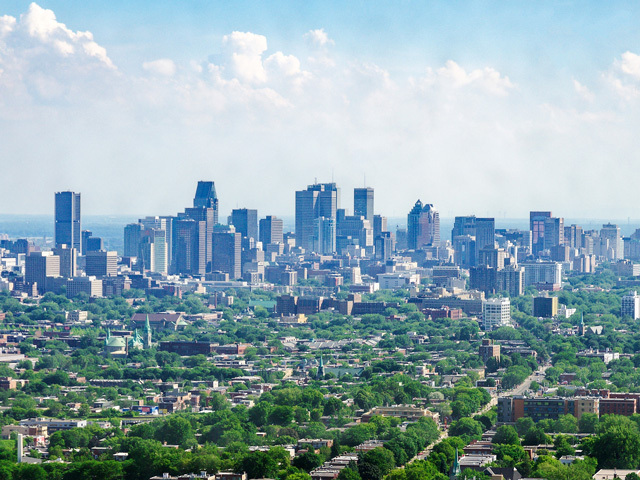 Cities need radical structural changes to reach net zero emissions – and they need them soon. Catlyne Haddaoui is a Research Analyst at the Coalition for Urban Transitions, a special initiative of the New Climate Economy jointly hosted and managed by WRI Ross Center and the C40 Cities Climate Leadership Group.